Please note that since writing this article, our church now uses Sony EX1 HD camcorders. I'm going to suggest 2 types of cameras that you could use as a starting point for your church video ministry's new department. The first one will be a consumer grade camcorder placed at the lower end of your budget, while the second one will be a Prosumer digital camera for those seeking a higher quality church videos. I'm baised towards Sony products, so you will only find camcorders from this manufacturer suggested, but please note that Panasonic and JVC do produce some excellent products, particularly in the Prosumer range. The Sony HDR-SR12 is High Definition Camcorder that records to Hard Drive, possesses a 12x Optical lens and would be suitable for a church that is mainly interested in recording to Dvd or producing Podcasts and have a very tight budget. Personally I wouldn't use a consumer camera for Church Video production, because you miss out on basic things like a manual focus ring, white balance, iris control, but if there is not enough money in your budget for a prosumer church camera, then this sony consumer camcorder can fulfil the task of recording videos for DVD duplication or providing overflow coverage or even streaming live church services on the internet. The X12 optical lens on the Sony HDR-SR12 should be adequate enough for a hall that is about 30m long, but you would need some good lighting to give the small camera CCDs a chance of producing good quality video pictures. Output formats available include composite, S-Video, DV and HDV. Because this is a last option camera, I wouldn't go into detail of using it as a church video recording device, but it will work perfectly with an affordable video mixer. One of my favorite cameras that I used to recommend to churches as an affordable starting point was the Sony PD170 DV camcorder, this camera was very popular in the broadcast industry for producing good quality fly on the wall documentaries, had a huge following in both wedding video circles as well as corporate production, but is no longer available new, though you could find used ones on Amazon, Ebay, etc, I don't like buying church video cameras second hand since you might not have the full history of the device. The replacement for the Sony PD170 video camera is the Sony HRV1U, this is a low cost HDV professional camera well suited for a church video department, very portable, has 3 CCDs, a X20 optical zoom, manual controls for focus, zoom, iris, white balancing, every thing a video professional requires including XLR audio connections for sound hookup. Having used the PD170 camera for many years, and hired the Sony HRV1U a couple of ocassions, I can say that you will not be disappointed in the capabilities of these Sony prosumer camcorders for both church service recordings and field video production (documentaries, etc), and you will be able to afford these reliable Sony products with a modest budget. 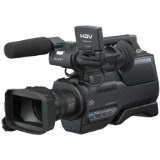 If you are thinking of buying the Sony HRV1U camera for church video use, you might want to have a look at the training DVD produced by Douglas Spotted Eagle called 'inside the HVR1' which gives an indept look at the camera and provides tips and instructions on getting the best out of this professional video camcorder. The church video below was produced using the Sony PD170 DV camera. We had a Paglight portable light pack which helped get better pictures from the low light filming conditions. What is the best church video camera? Sony PD170 video camera is a low cost camera with full features. The photo quality taken by this camera is awesome. Can I have an email address to discuss some of these ideas further? I am looking to buy two cameras in the UK, and need loads of advice. Please ask as many questions as you have here, for the benefit of other UK church video start-ups. As a church we have recently received a gift donation that is specifically designed for us to purchase some new video equipment. We have been given approx £2000 and with that money we wish to purchase two camcorders. They don't need to be the same (so it could be split £500/£1500), but being the same brand would be awesome. Essentially one of the cameras (the cheaper one) would be used for simply providing service coverage and basic videos. The second more expensive camera would be for the same thing on a sunday, but then used for making more professional style videos, doing stuff on the streets, interviews, church news videos that kind of thing. Ideally that would be in HD. Tom, thanks for the details, I'm not going to give you specific camera recomendations but will give you some advice that should point you in the right direction. There is no reason why you can't use the same camera during the week on a sunday, so maybe one camcorder instead of 2 would be a good approach unless it is compulsary to have 2. When chosing a camera you now need to consider if you are going for tape or tapeless. Tape will be easier to edit on most software, but takes longer to capture. If going tapeless be sure you know how to acquire and edit the recording format used by the camera. You also need to think of how you are going to keep important footage (archive). Make sure your camcorder can connect to the church audio system, so XLR connections are prefereable. Whatever camera you buy at that price range, it is not going to have excellent low light features, so start thinking about lighting up the stage for church usage. Hope this has given you some food for thought, any questions, leave another comment. Just wondering how you do sound with these cameras for a live broadcast. Do you take image from the camera and sound from a sound board to a computer and mix there? Or do you take the sound feed from the board to the camera and then take that to the computer for live broadcast? For a single camera recording, sound from the audio board is plugged into the camera, this is the setup for us on a Wednesday. For multi-camera shoot the sound from the audio board goes directly to the vision mixer.